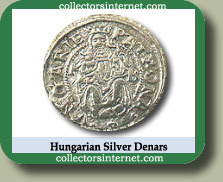 Minted during the reign of Matthias from 1611-1620. One of the earliest coins to clearly depict modern numeral dates. Matthias became ruler of Hungary in 1608 and emperor of Germany from 1612 until 1619. 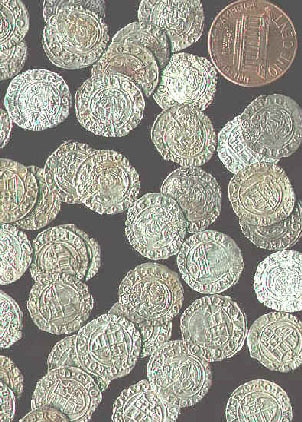 These tiny silver coins were all struck during his reign, except for those dated 1620 (after Matthias' death) that nevertheless bear his name. 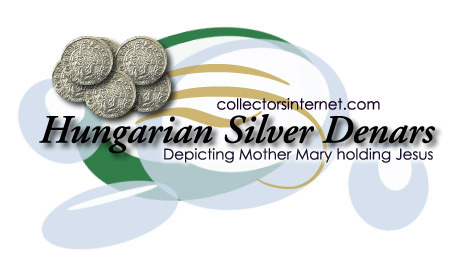 One side shows the Madonna with the infant Jesus in her arms, around which is the inscription "VNGARIE PATRONA" - which identifies Mary as Hungary's patron saint. The reverse shows Matthias' shield of arms, sometimes surmounted by a crown, coat of arms, with a highly abbreviated inscription naming Matthias and listing the many lands over which he ruled. These coins measure approximately 15-17 mm in diameter, or about the size of a dime. Details are crisp and sharp where struck fully, although crude strikes on a few may render some of the inscriptions a little difficult to read in spots. All of these coins have readable four-digit dates, ranging from 1611 to 1620. XF: Only $28.50 each; 10 or more: Only $18.50 each. AU: Only $38.50 each; 10 or more: Only $30.00 each. UNCIRCULATED: Only $78.50 each; 10 or more: Only $58.00 each. (Mint State 60 to 63) with original luster. Limit: 20 of each grade per customer at these low prices.